Tonight is the night. Christmas Eve. The night where Santa Claus and his trusty reindeer soar across the skies to deliver presents to all the good little boys and girls around the world. But tell me— do you know where Santa Claus is right now? Santa's workshop in the North Pole remains a mystery, but believe it or not, we now know the exact location of Santa Claus himself as he travels the world on Christmas Eve. Nobody ever used to know when and where Santa was, but thanks to a fortunate mishap by Sears Roebuck in 1955, things have changed. 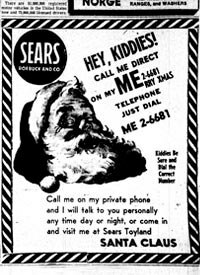 Sears in Colorado Springs ran an advertisement on the night before Christmas, providing the phone number to Santa Claus himself, prompting kids in the area to call Jolly Old Saint Nick. One problem— the number was wrong, and instead of reaching Santa Clause, children were reaching CONAD, the Continental Air Defense Command. 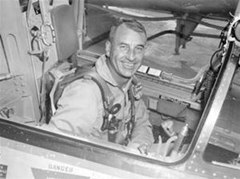 So, on Christmas Eve, the kids called the CONAD Commander-in-Chief's operations "hotline" at Ent Air Force Base where the Director of Operations, Colonel Harry Shoup, picked up the phone. His first call was baffling. It was either the Pentagon calling or General Partridge, Commander-in-Chief of CONAD. But it was neither. Instead, he heard the voice of a shy little girl asking him, "Are you really Santa Claus?" And then a tradition was born. Colonel Shoup had his staff check the radar for indications of Santa making his way south from the North Pole. Children who called were given updates on his location. Finally, media from all over the world rely on NORAD as a trusted source to provide updates on Santa's journey. NORAD uses four high-tech systems to track Santa – radar, satellites, Santa Cams and fighter jets. 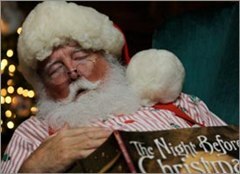 If you want to know more about how NORAD currently tracks Santa Claus, visit NORAD Tracks Santa. 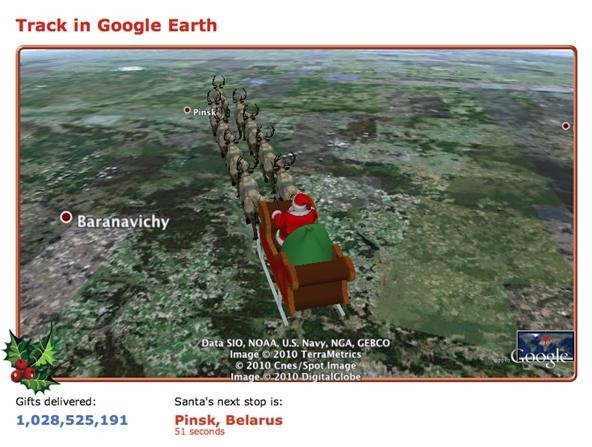 So, go to the NORAD Santa Tracker 2010 official site and start discovering Santa Claus's location via Google Maps OR Google Earth, which is currently around Belarus. If you're having trouble viewing Santa's location in the world, no problem. There's some tips and tricks available, which will get your computer system up and running in no time, so you, too, can track Santa Claus. 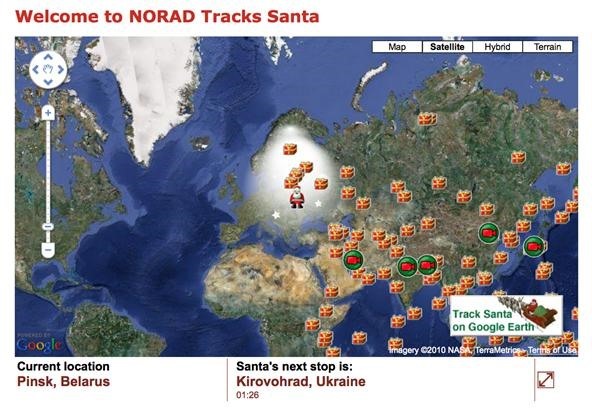 With NORAD Tracks Santa you can follow Santa on his Christmas Eve journey in Google Maps or Google Earth. Explore YouTube videos and Panoramio photos from each location that Santa visits, and track his route in Google Earth to watch him fly around the world. Google Maps will show Santa's entire route as he travels the world on Christmas Eve. At the bottom of the Google Maps screen, you'll see Santa's current location, as well as where he's headed next. Count down the minutes to his next stop! Click here to learn how to track Santa in Google Maps! To see Santa up close as he travels form city to city, check out Google Earth. 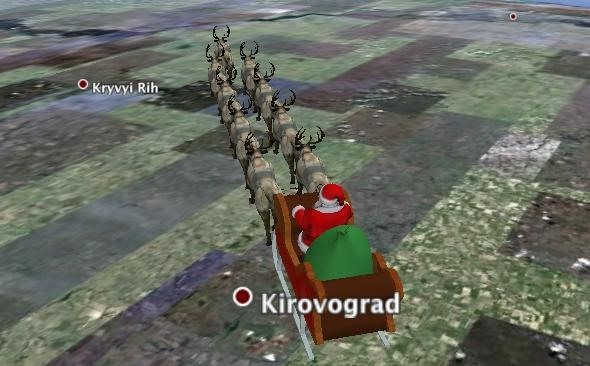 Click here to learn how to track Santa Claus in Google Earth!